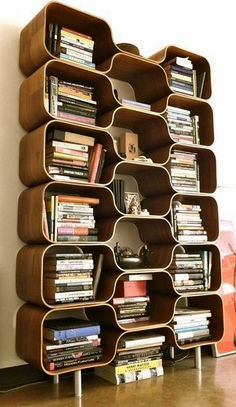 Smart, affordable DIY design ideas for cool people who like modern home furnishings. 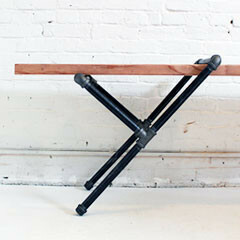 How to use black iron pipes to make a modern bike rack. 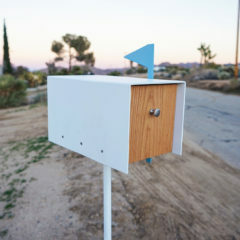 Ben Uyeda gives an update for the container house he's building in Joshua Tree. 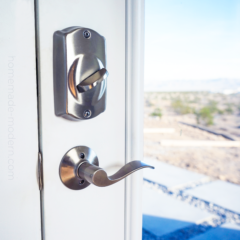 Ben gives an update on the container house he is building in Joshua Tree. Ben gives an update for the container house he's building in Joshua Tree. 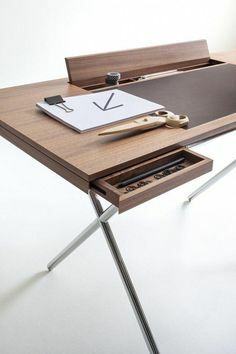 Steel and wood workbench with free plans. How to inlay grout into wood. 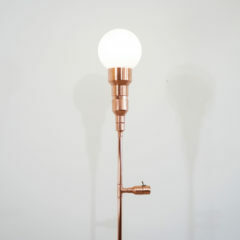 How to make a lamp out of copper pipes that is dimmable. 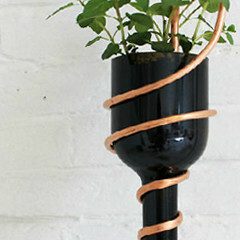 How to make a dimmable lamp out of copper pipes. How to make an outdoor bar with poured-in-place concrete countertops. How to make a dining table out of tigerwood using just three power tools. 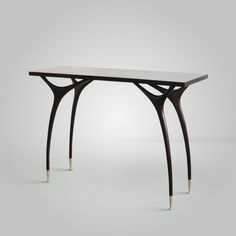 Ben design and builds a modern dining table using oak and steel. 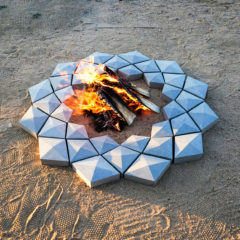 Ben Uyeda designs + 3D prints a silicone mold to build a geometric concrete fire pit! 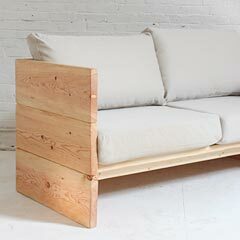 In this episode, Ben makes an outdoor sofa out of Cumaru deck boards and outdoor cushions from Target! Ben makes a stone bench made out of 2" slabs cut by a circular saw! Ben shares a how to make concrete patio pavers using a 3D printer for the mold. 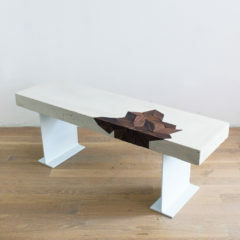 Ben carves a coffee table out of steel! Ben Uyeda makes geometric concrete planters made from silicone molds. Ben unboxes the Samsung Storm Trooper Vacuum sent from friends at Home Depot! 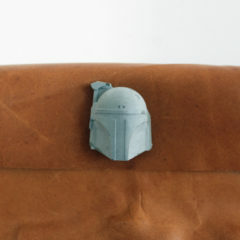 Ben compiles all the Star Wars DIY project into one post in honor of The Last Jedi! 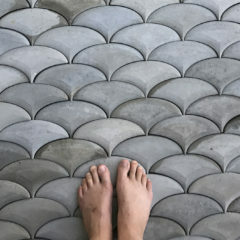 Ben makes a concrete backsplash for his kitchen since using LEGO bricks. 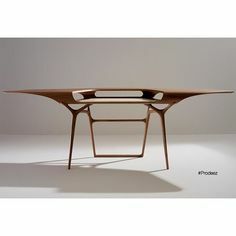 In this episode, Ben makes a white concrete table with laser-cut walnut inlays. Ben builds DIY plywood shelves with smart home tech. Ben builds a DIY hidden garden with LED grow lights inside a wardrobe. 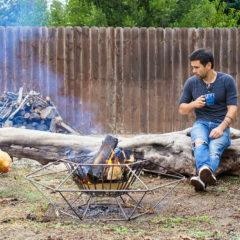 Ben designs and welds a steel geometric fire pit. Ben lays a concrete slab foundation to provide even ground for an outdoor toolshed. 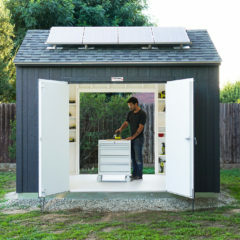 Ben builds a solar powered workshop. 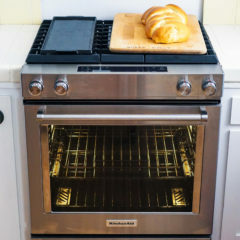 Ben surprises his mother with an oven upgrade for her kitchen and shares her bread recipe! 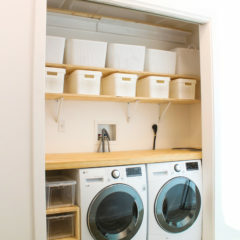 Learn how to renovate a laundry room. 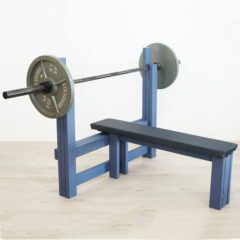 In this episode, Ben builds a fold-out home gym out of plywood that maximizes on space! 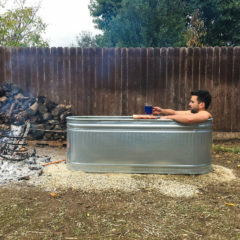 Learn how to make your own wood-fired hot tub! 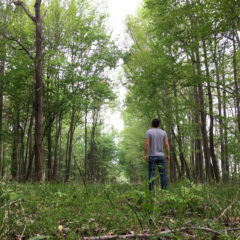 Ben gives an update on how his 2017 has been thus far. 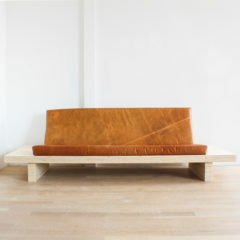 Learn how to make your own modern sofa with leather cushions! 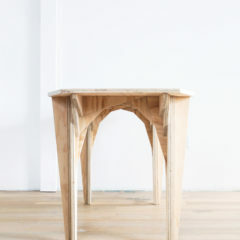 Learn how to make your own table with gothic, cathedral-like arches out of one sheet of plywood! 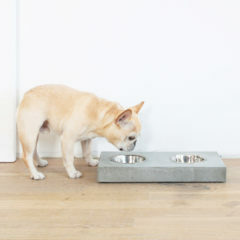 Learn how to make your own concrete dog dish using Quikrete 5000 concrete mix from Home Depot. 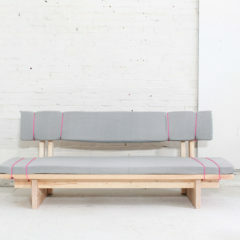 Learn how to make your own zig zag sofa with a built-in countertop in the back! 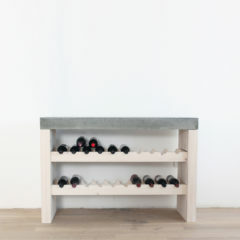 Learn how to make your own concrete and wood wine bar with HomeMade Modern. Learn how to build your own media console designed for your audio/music equipment with HomeMade Modern. Learn how to make your own concrete toilet tank lid that holds your gadgets for you! 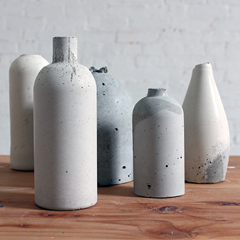 Learn how to make your own concrete lamps! Learn how to make your own concrete walkway! 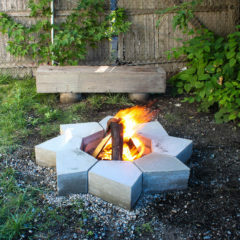 Learn how to build your own modular concrete fire bit! 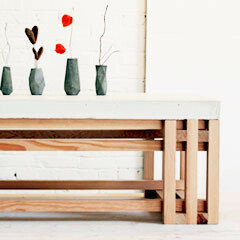 Learn how to make your own DIY outdoor dining table set with HomeMade Modern's Ben Uyeda. 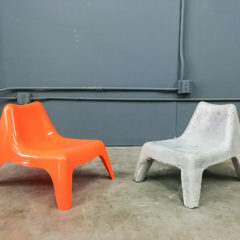 Learn how to make your own concrete chair using a plastic IKEA one as the mold! 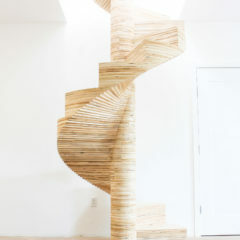 Learn how to build your own CNC spiral staircase! 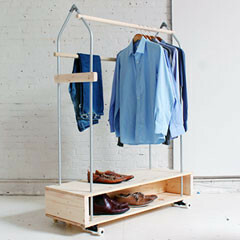 Learn how to build your own closet organizer to maximize storage space! 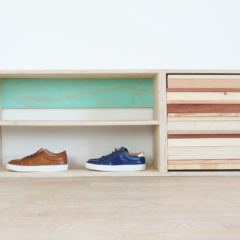 Learn how to build a stylish shoe organizer! 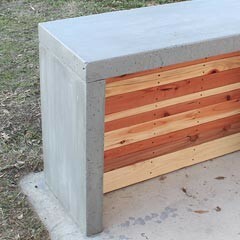 Learn how to make an outdoor kitchen with a concrete countertop for your deck, patio or garden! 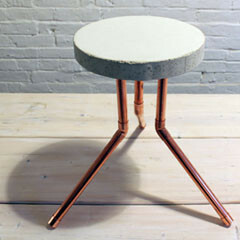 Learn how to make your own wine bar using copper and marble! 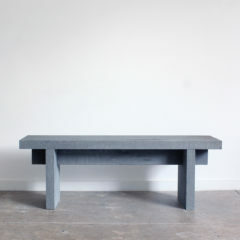 Check out this really cool concrete design competition from our friends over at Quikrete! 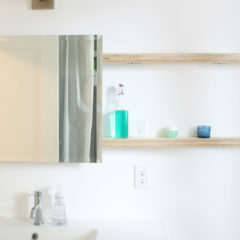 Learn how to make your own bathroom mirror that slides on plywood shelves with HomeMade Modern. This DIY Dish Rack is designed to fit over a sink! 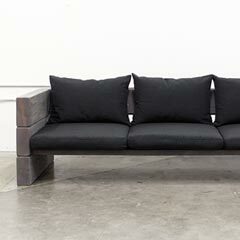 Learn how to make a sofa that can be used indoors or outdoors that require no sewing. 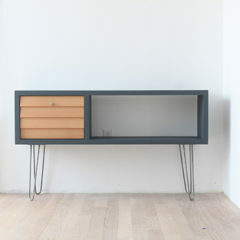 Learn how to build your own mid-century model media console with various pull + leg options. 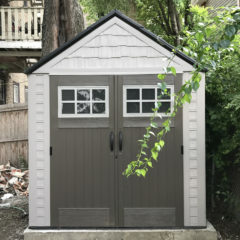 Here are my 10 favorite Ryobi projects from other DIY bloggers! 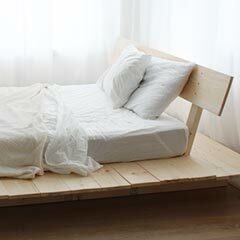 Build a modern, platform bed with storage in less than 10 steps. Learn how to make your own kitchen shelves and accessories. 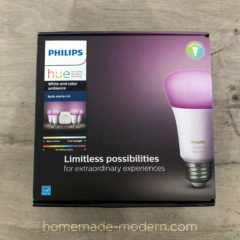 The HomeMade Modern book is now available! 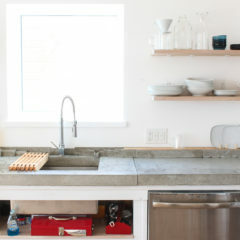 Learn how to cast and install your own concrete kitchen countertop. 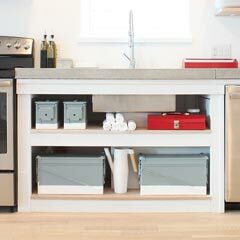 Learn how to build your own kitchen cabinets from scratch. Look Inside the HomeMade Modern Book! Get a sneak peek of some exclusive DIY projects in the HomeMade Modern book. 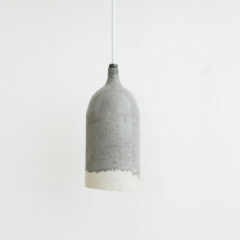 Use a common melon to create a textured, concrete molded pendant lamp. 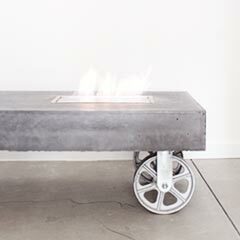 Keep your space warm with a rolling concrete fire table that also doubles as a coffee table. 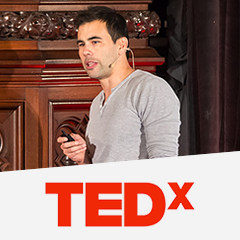 Watch Ben's TEDx talk from the TEDx Jamaica Plain event in October 2015. 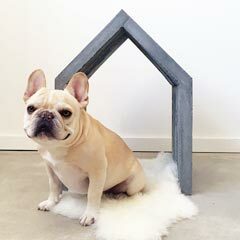 Create a modern concrete doghouse for your furry best friend. 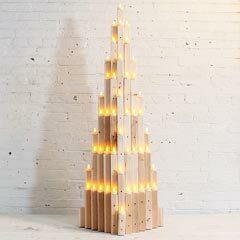 Put a modern spin on holiday decorating with this easy-to-make 2x2 Xmas tree. 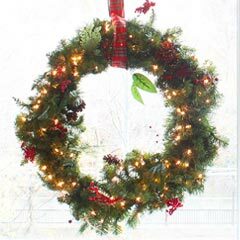 Get ready for the holidays with this simple wreath project we did for The Home Depot. 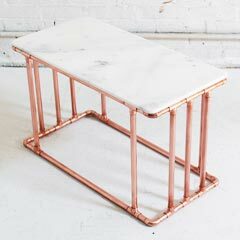 Easily make a copper coffee table with a marble top using Gorilla Glue. 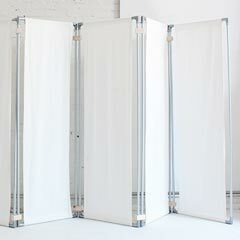 Create an simple room divider to separate an area of a larger room or segment an open-plan apartment into individual spaces. 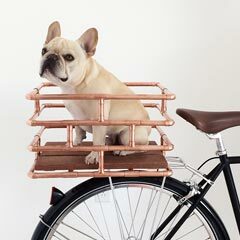 Create an awesome bike rack out of copper pipe fittings. 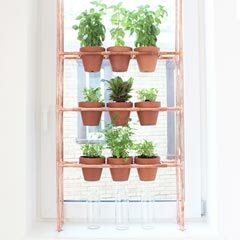 Easily make a window herb garden out of copper pipe. 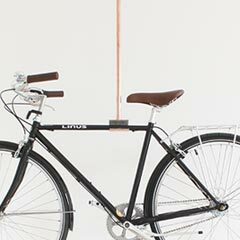 Create a minimalist bike rack out of copper pipe fittings. 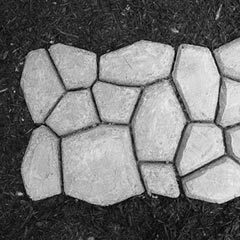 Make a garden footpath that looks like natural stone out of concrete. 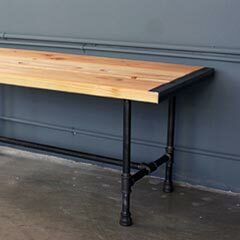 Make a standing desk out of wood and plumber’s pipe. Use Lego bricks to form a DIY concrete coffee maker. 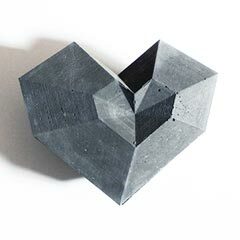 Create a concrete heart box with a 3D printer and silicone. 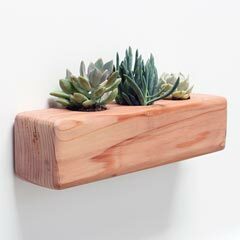 Make a modern wood planter for succulents in a few simple steps. 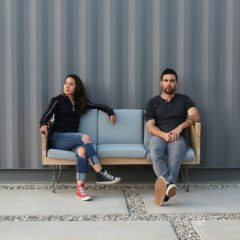 DIY a sturdy, modern outdoor sofa in just a few steps. 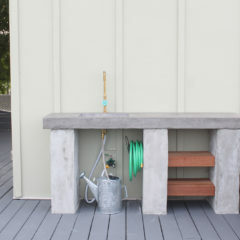 Create an outdoor bar using surface bonding cement. 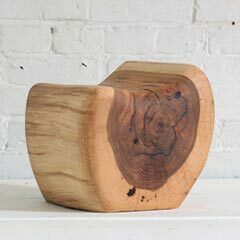 Easily make a rustic coffee table out of plumber's pipe. 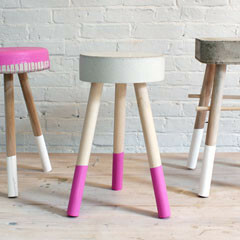 See how to create an improved version of the Bucket Stool with Coco Rocha. 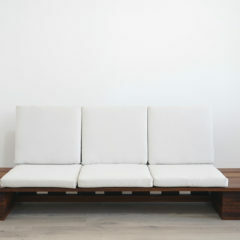 Easily create a comfortable and stylish wood-framed sofa for your living room. Easily create an outdoor grill station cart for your next summer event. 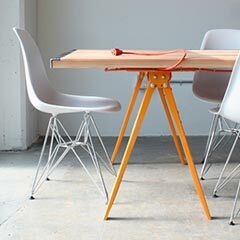 DIY a multipurpose conference table for your office space. 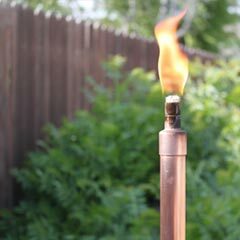 Easily make modern, copper tiki torches for your next outdoor event. 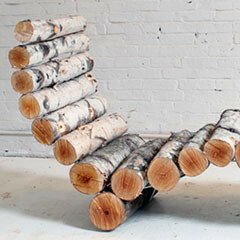 Carve a little log chair for your mini-me. 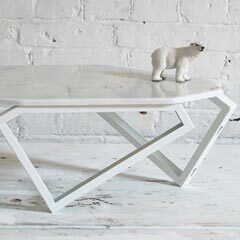 Easily cut stone tile to create a geometric marble coffee table. 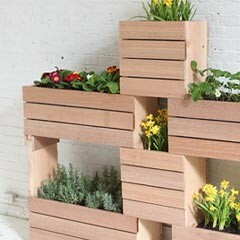 Create a vertical garden with easy-to-make modular, stackable planters. 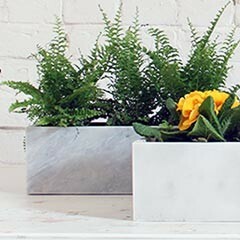 Easily cut stone tile to create modern marble planters. Give your kitchenware a quick upgrade by replacing plastic handles with carved wood. 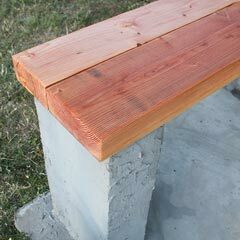 Make an outdoor concrete and wooden bench with Quikrete 5000. Use Legos to create a modern, rustic nightstand with a wooden drawer. Use Quikrete to create an outdoor bar or kitchen with a concrete countertop. Create a pour over coffee maker out of iron pipe. Easily make a pour over coffee maker out of copper pipe. 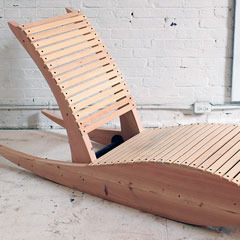 Make a modern fusion of an Adirondack chair and a rocking chair. 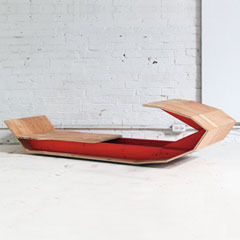 Put a modern twist on a simple sled. 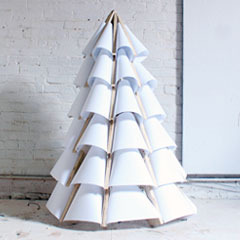 Make a modern wooden Xmas tree out of plywood. 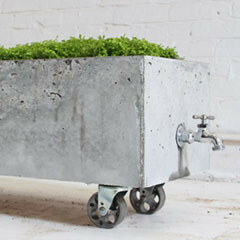 Create a concrete planter that waters itself. 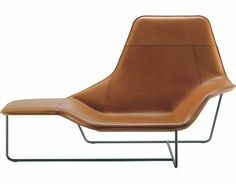 Easily create a hairpin bench with a back rest using our exclusive bench and chair kits. 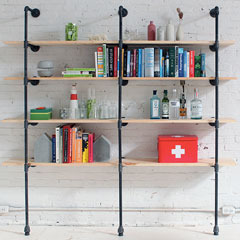 Make customizable shelves out of plumbing pipe. 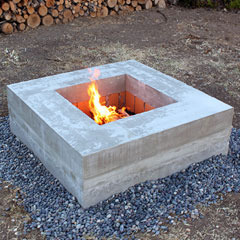 Create a modern, concrete fire pit in a weekend for outdoor entertaining. Easily color concrete by adding a pigment to water before mixing the concrete. Learn how to use silicone to make reusable molds for casting concrete. 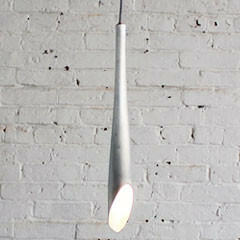 Learn how to turn a metal baseball bat into a modern pendant lamp. Make a easy, colorful, wooden pendant lamp with a compound miter saw. 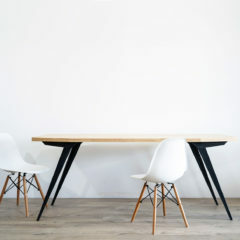 Make a simple, modern, mid-century-looking dining table with a single sheet of plywood. 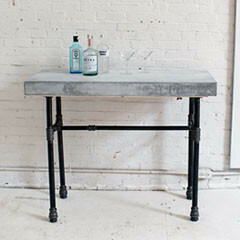 Create a bar table with a concrete countertop and a base made from iron plumbing pipe. 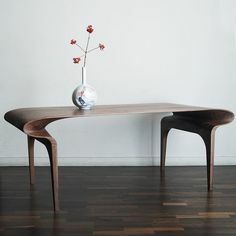 Give an existing table top an upgraded concrete surface. 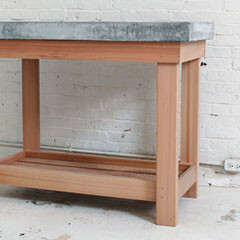 Make a DIY kitchen island with a concrete countertop and wooden base for indoor or outdoor use. 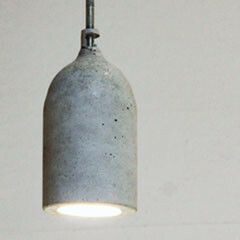 Make a futuristic-looking concrete lamp out of 2 bowls of cement mix. 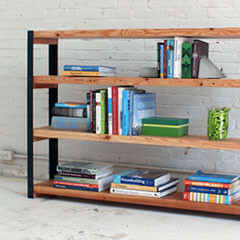 Make a rustic ironbound book shelf out of angle irons and 2x10s. 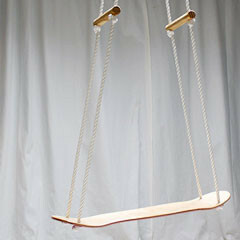 Create a fun rope swing out of a skateboard. 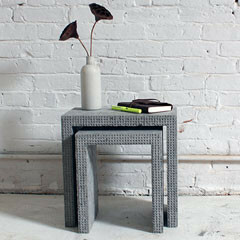 Use Legos and Quikrete to create nesting tables. 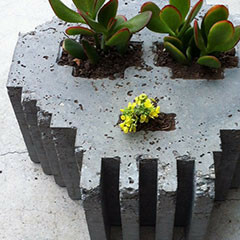 Make a fun, 8-bit video game-inspired planter with Legos and concrete. 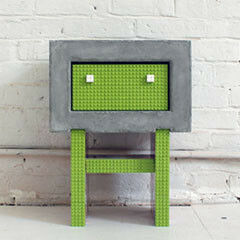 Use Legos to create a fun, robot-looking concrete nightstand. 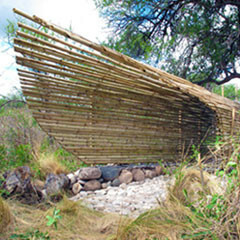 Build a home for your clothes out of EMT conduit, pine boards and a 2x8. 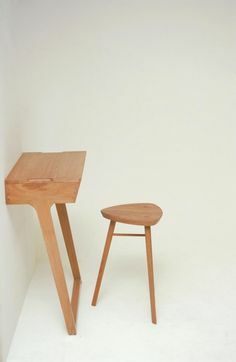 Create a DIY flip desk from a single sheet of plywood. 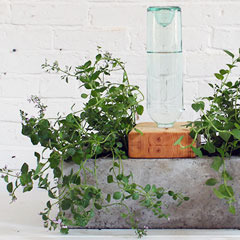 Make this DIY vertical herb garden in a single afternoon. 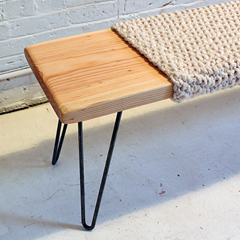 Combine knitting with a super easy woodworking project to create a simple project that benefits from a diversity of textures and materials. 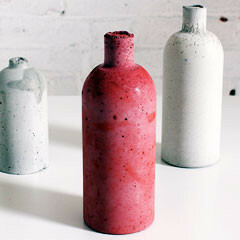 Recycle old bottles to create concrete vases. 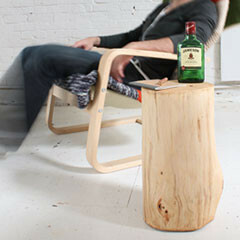 Easily turn leftover firewood into an end table or stool. 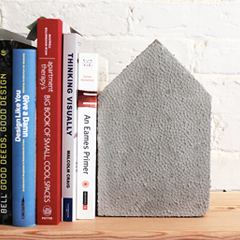 Reuse Styrofoam packaging to create concrete bookends. 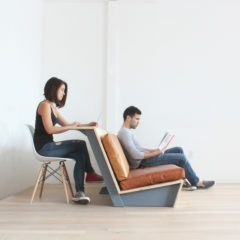 Create a home office that easily folds up and hangs on the wall. 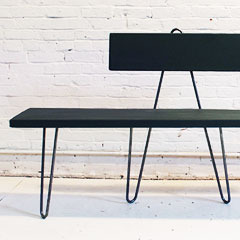 Make a modern, industrial-looking bench in less than 15 minutes without using power tools. 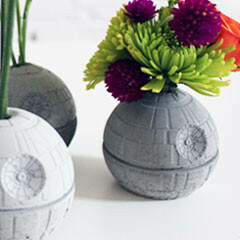 Use novelty Star Wars ice cube molds to cast concrete vases and wall hooks. 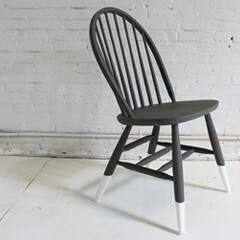 Make a modern chair using only zip ties and plywood. Make a stunning, modern gazebo for any outdoor space. 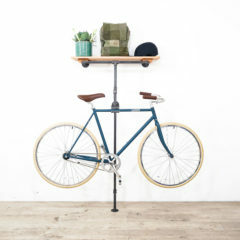 Create a versatile display that does double-duty organizing your tools and serving as a coat rack. 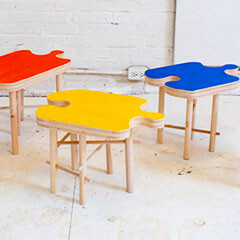 Create a fun, colorful, DIY puzzle stool with the RYOBI Jig Saw. 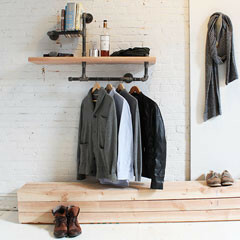 Create a modern, rustic wood bench and iron pipe shelf for your mudroom. 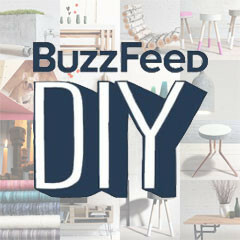 We're partnering with Buzzfeed DIY to create exclusive content that we hope you'll like, share and promote with friends. Thanks for your continued support! 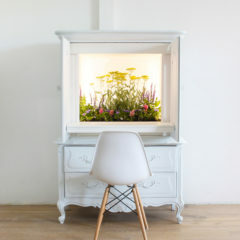 Turn an old cabinet into a concrete planter! 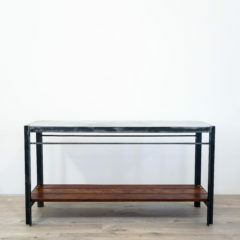 Use Quikrete Countertop Mix and stair balusters to make a modern coffee table. 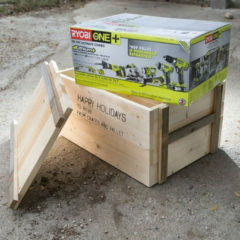 Use the RYOBI electric chainsaw to turn landscape waste into sustainable, modern outdoor furniture. Create a modern, geometric doghouse for your canine friend with HomeMade Modern and RYOBI. 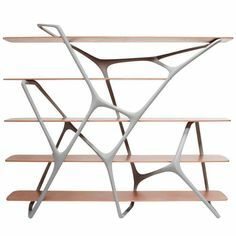 Make coat hooks and shelf brackets with HomeMade Modern's FREE, downloadable faceted, geometric templates. Make candles, coat hooks and a bunch of other handy knick-knacks with HomeMade Modern's Bloktagon templates. 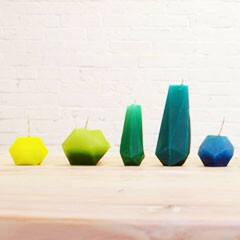 Create DIY candleholders with an industrial, modern style. Use plastic soda bottles to make stylish concrete pendant lamps. 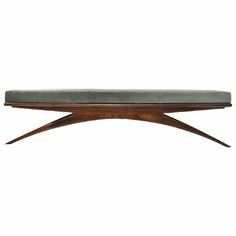 Follow up with additional ideas and answers to frequently asked questions on one of HomeMade Modern's most popular projects. Make this durable, spring form cake pan stool in a few simple steps. Make this durable, $5 bucket stool in a few simple steps. 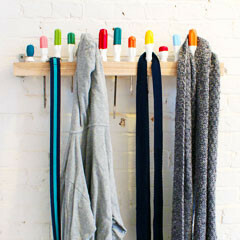 Bring some color to your mudroom! 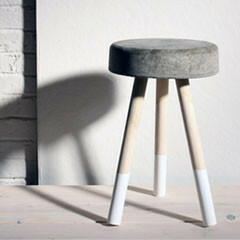 Make your own concrete lamp! 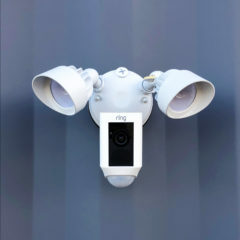 Complete this project for $7 in 3 hours. 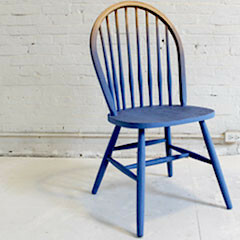 Use the Ryobi Power Paint Sprayer to give an eco-friendly, ombré finish to any chair. 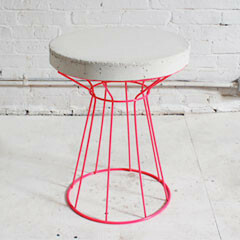 Give old furniture a new look! Re-purpose an old book or print some of your favorite photos to create a pendant lampshade. 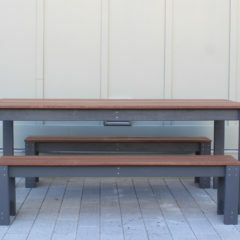 Build this table and bench in less than 6 hours for less than $240. 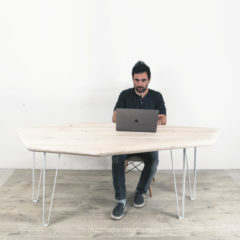 This sturdy dining table made from steel and solid wood can be built in 4 hours for less than $200. 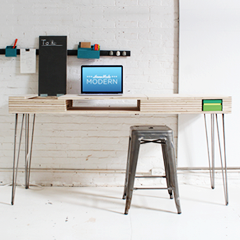 This plywood media console can be made in a few hours out of $40 of furniture grade plywood. 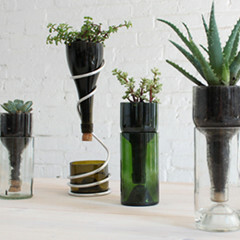 A bottle cut in half at the right point can be use to create a 2-piece planter that drains into itself. 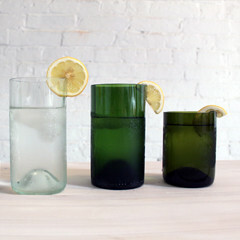 Create drinking glasses from recycled wine bottles. 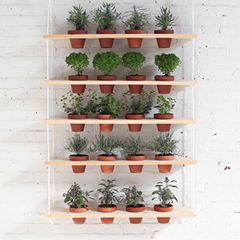 Our DIY hanging herb garden can be constructed for less than $30 in a single afternoon.